In the videos for the week these different aspects of mediation were discussed in terms of literature, film and games. I hope that you enjoy my transcripts of this weeks lectures. Please remember that I change the texts slightly to make translation easier. I remove repetitions, false starts and fillers. Any mistakes in the texts are my own. My spell check works in British English so there are some changes from the American English of the original text. Please let me know if you spot any errors or omissions. Firstly a reminder of who the speakers are. Jay Clayton, Professor of English at Vanderbilt University, our lecturer for the course. Let me invite you to reflect on the question of space in stories. David Herman, an important narrative theorist at Ohio State University (now moved to Durham University U.K.) has developed a special word to describe the spaces that we inhabit when we engage with a narrative, he calls this space Storyworld. I use Storyworld to suggest something of the world-creating power of narrative, its ability to transport interpreters from the here and now of face-to-face interaction….To the here and now…Of the world being told about. Ordinarily, when we think about spatial issues, we think about setting. How does an author create a setting in a novel just using words? Deanne: He maps the setting. Deanne: He describes, maybe, houses or geographical feature. Jay: So he (or she) uses description. Do you all like description in novels? Don: I think description adds an element of richness to the story. Jay: I love the word ‘adds’. It never really captures the supplementary nature of description. Let’s look at an example. 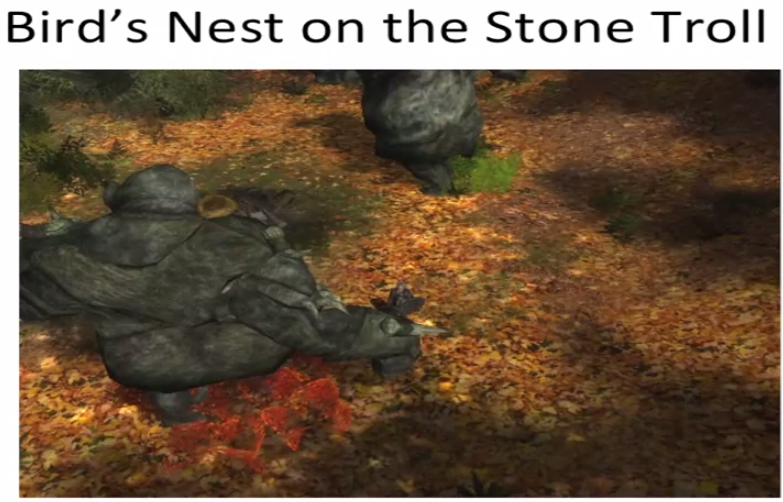 I have had a picture of one of my main characters in LOTRO at the Stone Trolls. I want us to look at Tolkien’s description of this scene and see how he describes the setting. Here is a picture from the game. You notice the half stripped branches which registers autumn which again is picked up with, with all those fallen golden leaves, and the stippling of sunlight in patches on the forest floor. It’s nicely rendered visually in the game. Herman draws attention to the automatic process of cognitive mapping that takes place when we imagine a place based on a description. Imagine this description without the picture. How do we make sense of Tolkien’s words? How does your mind process that verbal description or setting? Herman proposes that you actually engage in an automatic process of cognitive mapping. You situate yourself in relation to the described objects and you map it internally. You cause the fused mental model that you construct when you read a narrative,’ a storyworld’. You model the description, and then you relate it to existing cognitive models that you have of phenomenon in your real world. You relate the description of Tolkien, of the sun shining down through the trees, to your real life experience of sunlit paths in a forest. We know it’s autumn in this picture from contextual clues, like half-stripped branches. So you form a mental model of Tolkien by fusing the description with your existing ideas of somewhere in the forest. Here’s Herman’s explanation of mental modelling. stories trigger recipients to establish a more or less direct or oblique relationship between the stories they are interpreting and the contexts in which they are interpreting them. Blaine: One question that I have is, if these mental models come from our lived experiences and what we’ve seen and where imagination comes in with what we’re seeing when we’re reading. Jay: You mean like a child who reads this who doesn’t have a clear image of the forest, a child who’s lived in a city all of her life and doesn’t have a clear image of it. Any response to that? Chelsea: Yes. I think experience is definitely part of it, but I think that not all that experience necessarily has to come from real life. If you’ve read other things that can inform something that you are reading now. I think that certainly helps, but your question makes me think of when I first read about King’s Cross Station in the first Harry Potter book, I had never seen King’s Cross so what I went to in my mind was actually Union Station in Washington, DC. Jay: That’s great, and what happened when you saw the movie? Did it fit your mental model? Jay: This is a great example because you have a complex layering of models drawn from your imagination. From descriptions in Harry Potter, and from photographs you had then seen in fan literature, and finally this, film maker’s. Jay: So I think that really helps it give a little depth to what Herman is saying. That you draw off whatever sources you have, whether it’s real life experience, personal experience with forests, or just what you imagine a forest to look like. This prompts readers to relate ”two types of mental models”, one that they’ve built up from the cues in the text – sunlit paths, autumnal forest – and the other based on their prior experience with the real world. Narratives ask readers to search for analogies between these two classes of mental models, the textual model and the real life model of the world. So, Killian, let’s test this model of Herman’s against fantasy literature. Now, how can it work in fantasy worlds, which are really supposed to be fairly imaginary? Killian : It seems like it would present a problem. It seems like if the narrative departed too much from something that I were able to relate to, then the novel would cease to function appropriately for me. It reminds me of the ways, in so many points in Tolkien, we get incredibly thick, topographical description. We’re allowed to orient ourselves very specifically, almost as though we were reading a story of somebody’s travels to the countryside or something like that. These are the things that help me to ground myself in what’s happening, despite the fantastical side. 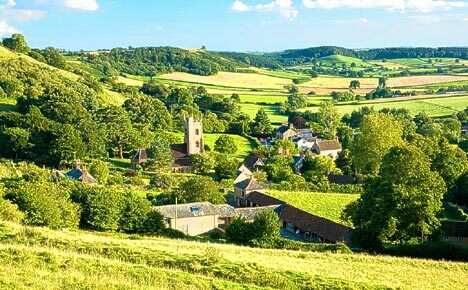 Deanne: I think it’s rural England, and English countryside. Jay: And there’s such a variety of topographical description. It’s clear that Tolkien is in love with the imaginary landscape that he’s drawing, the Shire. Jay: Yes, and even the towns where he grew up. It’s a fantasy realm, but it’s a fantasy realm that takes its reality, its particularity from modelling of those concrete worlds. far from merely providing descriptive background or ornamentation for the primary action in a story, spatial reference helps constitute narrative domains. David Herman. Jay: What does he mean by, constitute narrative domains? Blaine. Blaine: I think he means the world of the story. Deanne: Yes I think that he’s suggesting that the setting is actually creating the possibility for that story. Jay: Do storyworlds always play the same kind of role in every mode? How, how do they work in video games? Don. Don: I think in video games the setting may be even more important in terms of the idea that one wants to be immersed in any universal world. Things like graphics, music and sound effects that could be considered descriptive elements of the game as opposed to, or alongside, plot-based elements are very key in terms of feeling there is a coherent world in front of us. Jay: Video games take this element of ‘storyworld’ and raise the stakes. Video games can turn setting, space into a pleasure all into itself. Chelsea: It’s interesting you say that because when you get a game like Minecraft, you don’t actually have chunks generated until you explore them. This not only makes the game different every time you play it, but it makes the terrain a huge part of your game play. Jay: Let’s look at the entire scene from Tolkien again. The sun was now high, and it shone down through the half-stripped branches of trees, and the lit path with the bright patches of light. There stood the trolls: three large trolls…. Jay: It’s daylight. Why is that significant? Chelsea: Because trolls turn to stone in daylight. Jay: Everybody knows trolls turn to stone in daylight. Here is an aerial view of the game scene focusing on the bird’s nest on the shoulder. This image brings up a radical capacity of gaming that’s not shared by written text or by film, that’s the player’s ability to manipulate the camera. Every game allows you to do this in somewhat different ways. Sometimes you have more control, sometimes you have less. If Peter Jackson wanted to show you the bird’s nest he would have had to have given the view and none other. How does this change the feeling? Don: It adds an element of discovery to the unfolding of the narrative. In terms of, one would have to find this bird’s nest. It’s not simply presented directly in front of you and, moreover, if you’ve read the book or seen the movie, it’s something you can look for specifically. Jay: You can’t look for birds’ nest if you’ve seen the movie because the birds nest is not in the movie, it’s in the book. We’ll see in a second how Jackson handles the scene really differently. Chelsea: We also have an element where we have camera control by being able to switch the mode of narration that we’re experiencing in the game particularly with video games and camera angles because we’re used to watching cinema. This shift in narration based on the camera position is really obvious to us. Jay: Yes and liberating, I’ve noticed that you often like to play in first person mode with the camera zoomed all the way into the, character’s head. Chelsea: That’s a bad habit. Jay: It’s a habit, I don’t know if it’s bad or not. The over the shoulder camera angle is one that I tend to use. The ability to control the camera can be really empowering because you have a sense of freedom, as a player and it really changes your entire relation to space, in narrative, this becomes your space in a sense. That’s an illusion because you can only move where the game designers have allowed you to move. You can only take your character to the borders of the game and you can only see in the ways they’ve enabled you to see. But all storytelling is illusion. The different modes create different kinds of illusions through their control of space. Jay : Films create this spatial illusion in an entirely different way. We don’t even use the word “setting” to describe the place or the space of cinema, it seems inadequate. The word “setting” is very much more appropriate to verbal description. Film theorists have coined their own word for the way a filmmaker handles space. It’s called “mise-en-scene” which refers to everything that goes into creating an image on the screen. The camera angle the sound, the lighting, the sets and props, all the elements that create for the viewer, the spatial awareness that’s up on the screen. Jay: Peter Jackson handles this whole setting in an entirely different way. He sets it at night, so you don’t see the bird’s nest, Frodo, far from being cheered up from his wound is really suffering, he’s on death’s door in this scene. Jackson has taken the liberty to do it this way to compress several elements together and make this scene fulfil a number of plot points. To help you understand that Frodo’s wound, taken in the shoulder from the Nazgul blade, is really threatening his very life. At the same time to gesture towards this return to Bilbo’s world. The greatest liberty that Jackson takes is that he has an entirely new character. He has the elf Arwen come on the scene. Jay: I want to stress yet again something we’ve said many times in this class. We are not concerned with whether Jackson has taken liberties or not, this is not about fidelity. This is about thinking through the modal shifts that occur when you remediate the novel in cinema. The next scene is one of the most dramatic in the first volume of the movie, The Ride to the Ford, a scene that also does not appear in Tolkien. Chelsea, why do you think Peter Jackson added Arwen to this scene? Chelsea: The addition of Arwen to this scene accomplishes several things. In the first place, it compresses the action so that we can be introduced to this character and moves the story along at the same time. It also it also adds some drama with her unexpected appearance. Killian: There’s also the suggestion of romance. Jay: Which is a big part of the back story. It doesn’t appear that prominently in the Fellowship of the Ring, but it’s a big part of Aragorn’s back story. Deanne: She is one of the bigger stars, there are so many big stars in this film but she is one that I’m sure the audiences wanted to see. That is another possibility. Chelsea: There are also not that many female characters. Giving such a prominent one an early entrance is just good balance. Jay: Oh, exactly! People have long noted that there aren’t many female characters in Tolkien. The fact is that it’s a deficit of a lot of fantasy literature, though recent fantasy novelists have made up for it and certainly added a lot of strong women’s roles. That’s what Jackson was doing there. It added, giving us a strong female role and putting her in an action scene. The ride to the ford is really amazing, great camera work. It is one of the more thrilling cinematic moments in the entire film given to a woman with an action role. It changes Tolkien’s tale pretty dramatically. What is Jackson accomplishing by compressing so many elements into this one scene?. Chealsea : In the first place the expectations of the film are a bit different than that of a novel. It’s often necessary for a cinematic production to be a lot tighter than Tolkien is inclined to be in general. So having fewer characters fill the role of many characters is a little more efficient for that medium. Jay: What else does the addition of Arwen accomplish in this scene? Don: I think on the one hand, Arwen is a reference clearly to the pre-Raphaelite school, the way she looks in terms of the halo of light around her, the extreme beauty of the figure. On the other hand it’s a transformation of “La Belle Dame sans Merci” type so far as Arwen is a healer. She comes there to heal Frodo, rather than to halt the action or to stall the hero. She is the one who takes Frodo on her horse and advances the plot. 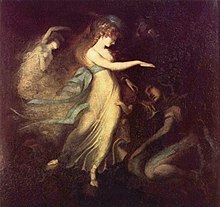 Prince Arthur and the Faerie Queen by Johann Heinrich Füssli, circa 1788. Killain: This also reminds me of Britomart [from the Faerie Queene] who we’ve just seen recently as well. Jay : Oh, that’s right. In fact the scene is a scene of healing as will be the subsequent scene in Rivendell where Elrond, her father, continues the healing process. Here Aragorn and Sam are looking for the Athelas plant, which has great herbal virtue in healing a wound. Athelas is the main healing potion in the online game. They picked that out and use it effectively. Your mention of the pre-Raphaelites is something we’ve talked about before. The visual iconography in Jackson’s film draws as much on the nineteenth century pre-Raphaelite imagery as it does on medievalism in general. 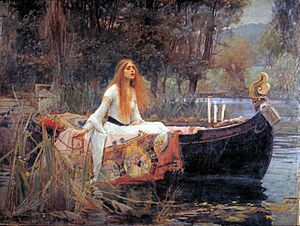 Jackson is really enamoured with the broader cultural iconography that the whole twentieth century has inherited from the Pre-Raphaelites and the late Victorian aesthetics of the flowing robes, the long hair, the jewellery. We, we talked about this before. But you see it in that glowing image of Arwen as she walks towards the camera in this scene. And you see it even more strikingly in this scene of Galadriel. Floating down the river to say farewell to the Fellowship in Jackson’s film, The Fellowship of the Ring. Jay: What did you think about when we were at the stone trolls? Don? Don: I was a little, cavalier. I wanted to join in the fight and Regnavor was very excited to get in there. And with one swat of the troll’s hand, I was squashed. Jay: You were squashed. You hadn’t died at that point. And your title of the un-vanquished disappeared in one foolish moment. Don: I think I had died at least one other time before that. But, yes, that was a pretty sad death. Jay: It was a level-60 encounter. You were what level?. Jay: 20? I warned you! I warned you! I told you about area of effect attacks. Chelsea: Yes, she scoped out the AOE range and she stepped judiciously out. Jay: And you took one step back. So, what kind of view did you get from back there? Jay: That’s relevant. Camera issues are relevant to your experience in game. Chelsea: Right. I was having trouble with the controls. I couldn’t get them to calibrate very well. But then once I was able to tune in properly I got actually a pretty good view of the whole scene. Jay: How did your camera troubles effect your engagement with the, the story? 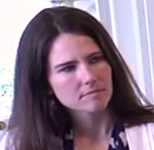 Chelsea: It was a little…, maybe I could say ‘fourth wall’ breaking. Chelsea: It was also a little bit terrifying because, at the time, I was having the camera trouble, it made it so difficult for me to determine which direction I was walking in. I was really worried I was going to stumble right into the fray and just be ‘one-hitted’ out of there. Jay: Were you engaged in the story-line, Blaine, when you were in there, or were you thinking more of the fight? Blaine: I was thinking more of the fight. But I was definitely; when the troll came down; I was excited. I’m sure that my heartbeat started racing a little bit as I was trying to stay safe and coordinate myself with the others. Don: The second time I died, it was because of my camera. I wanted to get like a more third person view of the situation. Because of where my camera was angled, I couldn’t see the troll could potentially squash me. It was one of those compromising moments where I wanted to get in and see more and, as a result of that, I ended up compromising my ability to maintain safety in the situation. Jay: You get better at this as you play the game. People make silly mistakes like that all the time. You go into a big raid and, particularly if you’re a vital part like a healer, you make some mistake. You step off of a narrow ledge and fall to your death. The whole 12-person raid wipes, because you’ve done that. If the members of your raid are not charitable you might come in for some abuse. I have and it’s an annoying thing that can occur to you. It makes your heart pound when you’re there in a raid. When you’re running an instance for the first time and you’re the only new guy and you’ve got experienced raiders in there, you don’t want to make mistakes. You’re as nervous as Blaine was when that troll’s coming toward you. You say “oh God, oh God. They’re going to really abuse me if I fall off the ledge and die in a stupid way, or if I don’t see the poison that’s just been thrown on me, and I die that way, or if I let the main tank die”. You get a lot of grief from your fellow questers. What I’m driving at with this line of discussion is, are you engaged at that moment in the narrative, or are you engaged in dealing with the mechanics of the game? Is the thrill that you feel, Blaine, your heart racing, – is that generated by gameplay, or by the story that you’re inhabiting? Blaine: It seems to me that they were together and combined. Jay: They ought to work together and be combined, but do you think they really do? Blaine: I felt like that… I felt with the narrative of the troll coming out and my and having to react on the keyboard. I felt like they were combined. Jay: You know you’re an ideal member of this class because you demonstrate our love for the fusion of gaming and narrative. But, I’ve heard, from a lot of gamers, that they just couldn’t give a nickel for the story, what a novel might call ‘setting’. It’s a special world you’re inhabiting and it’s really complex. It’s fusing not only the fictional world of the narrative with your mental model of the real world, that helps you orient yourself in space. It’s also fusing it with all of the rule- generated emotions, and cognitive processes, to try to remember which key to click, where’s your attack, where should you be positioned in the fort, who should you be healing? All of those decisions are game-generated, rule generated decisions, not narrative. Some theorists of gaming want to say that narrative is truly not important to games. Blaine’s response is my response – that even in the thick of the most intense action, part of my pleasure comes from that fusion. I came into that scene as the tank Cherryble. The other players say “Cherryble hold the Agro.” Somebody else that knows me well might say, “Jay, Jay, Jay, Jay, Jay! He’s getting away from you” and someone else might say “tank, tank, tank.” Your very identification procedures are multiple in ways that I am not aware that any other media engages in; such multiple identity positions at once. Don: In terms of the importance of story to gaming and the idea that the action, the combat, is one thing and the story line is another. One thing that motivates these battles that we are in is what comes next. In terms of the excitement that Blaine was describing, part of that is based on the fact that once we defeat this troll, we get to move to the next part of the story. Jay: That’s right. Going up a level is the way to implement that. You know something else? A good part of your engagement is not really going to the next level of the story but also the reward. A lot of people are in it for the treasure. They want that great piece of armour and are worrying about the role that will give them that piece of armour. Don: It’s almost as though they’ve ‘gameified’ the story. You get a series of rewards so you can progress the narrative. Jay: Very much so. It’s not all. I think the causal chain goes in the other direction. It is games that have given us the notion; the games implementation of levelling up and rewards for each level that has given the rest the world the idea that we ought to ‘gameify’ some of our tasks. 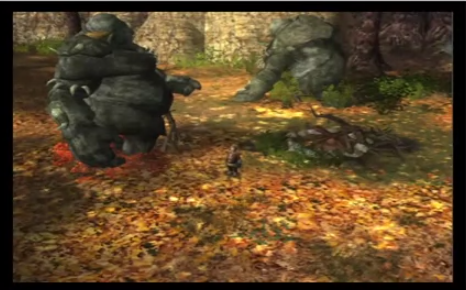 Jay: That brings us to the end of our encounter at the Stone Trolls. 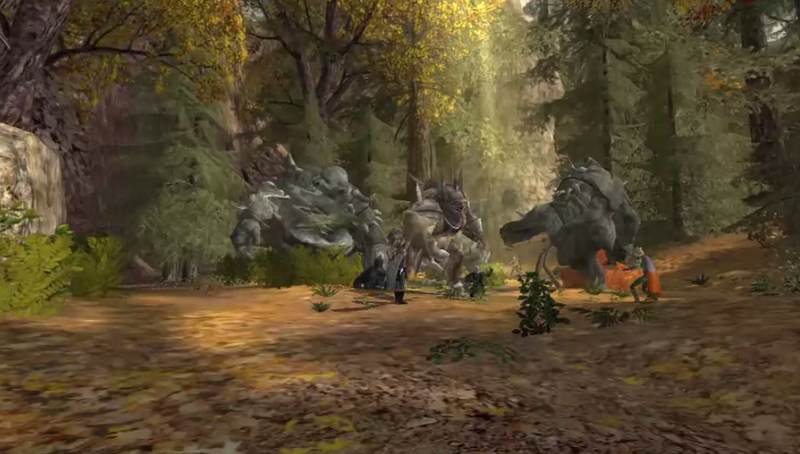 We’ve seen how the novel describes the fellowship stumbling on Bilbo’s trolls in broad daylight. Tolkien plays the scene for comic relief, a bit of a respite after the thrilling battle at Weathertop, and the fellowship’s difficult journey through the Trollshaws. The movie uses this same to deepen the viewer’s sense of Frodo’s agony at the wound he has received from the ring wraith. And to introduce a new female character to the story, the beautiful, Pre-Raphaelite inspired elf, Arwen. The game lets you make what you will of this locale, lets you fight the troll in a group, take him on all by yourself If you’re a high level character, run away, or even skip the encounter altogether. But after the fighting is done, how you celebrate is up to you. Jay: The concept of remediation has important implications for something that, in literary criticism, people call “point of view.” All media that tell a story have point of view, even paintings which inevitably, or often, have some narrative content, and that narrative content carries an implicit point of view along with it. We are more used to talking about point of view in relation to the novel. In the novel is a form that has developed a whole range of techniques for exploring different kinds of point of view. Often a lot of the meaning of the novel comes from the perspective that the novel presents as its point of view. The most familiar point of view to most readers would be first-person point of view. You can have different kinds of first-person points of view, where there is a narrator speaking in his or her own voice, as in “I.” A really famous example would be David Copperfield by Charles Dickens. Not all first person narrations pretend to be autobiographies. They all have to have an autobiographical element, but sometimes the narrator can act more as an observer of the action than as the hero. He is a participant in the action, or he couldn’t narrate it, obviously, but he might not be the main character. That is the point of view that F. Scott Fitzgerald uses so effectively in The Great Gatsby. A first person narrator always reveals at least two things about the world. That narrator reveals something about himself or herself sometimes without even realizing it and, of course, the narrator gives you access to the rest of the story. There’s a double logic to that narration. It’s almost always there in first person narration. The other main division in written text is omniscient narration. Omniscient is a fairly easy concept to explain, but it can be quite nuanced in execution. Omniscience is where the perspective of the narrator has total access to all the characters’ minds and to action wherever it’s taking place, at any time. That is full omniscience and that kind of full omniscience can be of several different sorts. You can have a personified narrator that’s working in third person so it’s not an “I” it’s not a first person narrator. Nonetheless it has a little character, sometimes it’s just a tone of voice, sometimes there’ll be an ‘I’ that the omniscient narrator will use with no pretence that the narrator is really a character in the novel. That’s what I mean by a personified omniscient narrator. There is also, more commonly in fact, an anonymous omniscient narrator, just a bird’s eye view of the action that zooms in whenever the narrator wants to dramatize a scene, then pulls back out and reflects on the big picture. Is it possible to have a narrator in a video game? Don: Absolutely! There are some games that literally have narrators where the game will open up with someone telling a story. 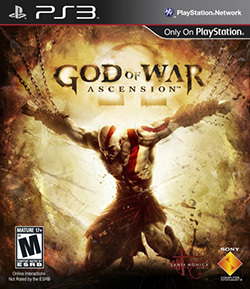 I’m thinking of the God of War franchise. There’s this very important component to the cinematic feeling of the game that is totally bound up with the narrator’s voice. Jay: Excellent.! Other games that you can think of? Chelsea: Sometimes you have games where the player is essentially the narrator, particularly true in sandbox type games, where you’re controlling all the action. In fact there’s a genre on the web of Minecraft games where you just watch YouTube videos of people playing Minecraft and narrating their actions and they are really mesmerizing. Jay: Did you just say you were a fan of those? Chelsea : Yes. I’m a huge fan of those. Jay: Okay, great! Any other ways in which games can have a narrator? Don: I’m thinking of cut scenes and how the cut scene moves the story along on the one hand, and on the other hand it provides a unifying logic or cohesion so that the various components of the game that may seem fragmented all come together in these cut scenes. Jay : That’s right but it, it’s a very particular kind of narration, isn’t it? Because it doesn’t extend over the entirety of the game, it’s an interruption. Who or what is a narrator in a film? That’s a trick question because films can have different kinds of narrators. A lot of films don’t appear to have a narrator. When you’re watching a film that doesn’t have an obvious narrator, who’s the implicit or the implied narrator? In this instance you hear Cate Blanchett. talking in the role of Galadriel about the back history of the ring, the past history that sets up the events that the film will be about. This would ordinarily establish that voiceover as the narrator of the film, and maybe even the main character of the film. Except this is a prologue to the action of the film, and you can sense that because it’s also rolling over the credits. Of course we know that Galadriel doesn’t turn out to be the main character of the movie. This is really an extended passage of exposition and Peter Jackson handles it pretty well. The graphics and the visuals that her voice rolls over are compelling. After the exposition the very next scene has another voice over from a different character this time, Bilbo, who is composing his memoir. This tracking shot, going around the corner in Bilbo’s house, is designed to reveal who the speaker is in the voice over. In the third scene we, at last, see Frodo reading the book. I want you to observe how the director establishes that Frodo is going to be our centre of consciousness, the protagonist for a major part of the movie, not all of it because The Fellowship of the Ring cuts back and forth between Frodo’s story and the larger story of The Fellowship. When Frodo lifts his head, you realize that he is hearing the singing of someone that we know is Gandalf, because we’ve read the book and seen the movie many a time I suspect for most viewers. This is a way for Jackson to establish the centre of consciousness. When he lifts his head, he hears what we, the spectators, the audience is hearing. That helps us identify with him and him, it cues us right in. His lifting his head with attention is a signal to us to adopt his point of view, not the camera’s. The camera zooms in on his face with his eyes open in a startled fashion. That is a shot that establishes that he is, the centre of consciousness, the person doing the listening, and the zoom in is a canonical example of the language of cinema for consciousness. 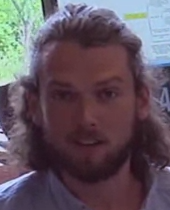 As the camera zooms in to his face, you understand that he is thinking. You can see from his expression that he’s thinking happy thoughts. He’s very excited to go greet Gandalf. Just as Frodo takes off running, the camera switches from the direct shot, to what we could call a reverse shot, which is the shot of what, Frodo’s seeing. With this gesture the film has completed the basic act of helping the spectator identify with the central character. So what, what is the director of this film trying to accomplish with multiple voice overs. ? Don? Don: I think the first voice over is to establish this sense of an ancestral past. Then when Bilbo’s voice comes in it signals more of an immediate sense of presence. Blaine: I also think it’s interesting when the camera zooms in on Frodo, we hear birds chirping. So it really situates us in the Shire and brings us to that environment. Jay: Games have points of view as well. The basic division is between first person and third person. There’s a genre of games known as first-person shooter. 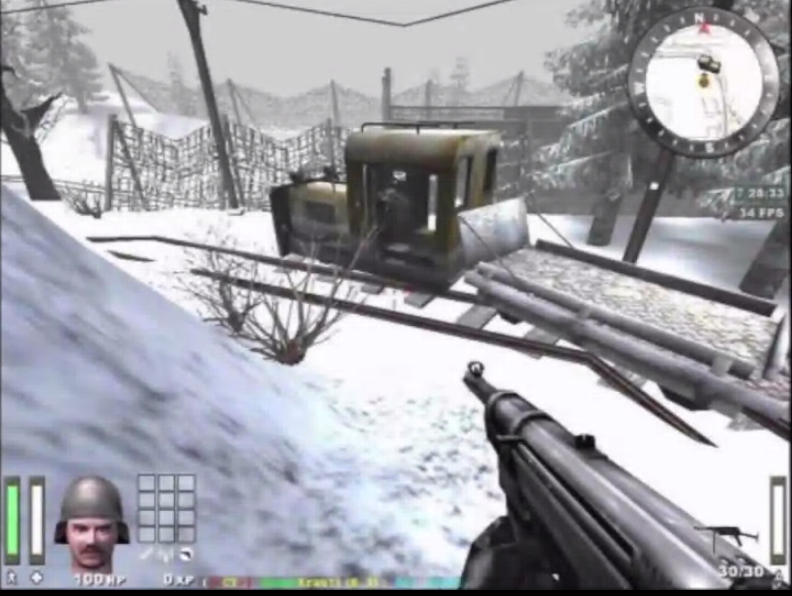 Can you all think of first-person shooters? Don, you played any first-person shooters? Don: Oh, yes, plenty of them. The “Urgame,” or” urtext” of first person shooters might be Wolfenstein 3D. I think this was around 1992. Jay: Call of Duty? Definitely, yes. Here’s a screenshot from a much later generation of Wolfenstein. This one is called, Enemy Territory. You can see that the camera’s perspective directly inhabits your avatar’s perspective. As you move through the game you have a first person point of view at all times. In this case you’re holding a powerful looking gun waiting for someone to come within your sights. The other great division in video games is third person. Different from first person shooter, where the camera is right inside where your avatar’s head would be, third person gives you a fair amount of control. That differs from game to game, but you often have control of your character’s point of view. You are looking at your character as well as directing where your character looks. In a way, it’s like being the camera and the character all at once. It’s a really interesting hybrid point of view and it takes a little getting used to if you haven’t played third person games before. It’s really a quite new manipulation of point of view. It’s certainly not a verbal point of view, as in a text. It’s also not the point view that the director decides on for you. You get to be your own director to a certain extent. In the next section Jay refers to his character Cheeryble moving inside the kinship house. The students he is speaking with turn to watch the video but we do not see it. After Jay’s text (below) is a short video that I made which I hope represents the camera positions he is referring to. Here I am in my main character, Cheeryble and we’re inside Vicarious Universe’s kinship house. It’s a kinship house that’s stocked full of trophies from all our triumphs over the years in gaming. As you see when I move along the cameras located behind the main character, a little bit over, behind Cherryble’s shoulder. This is one of the most common points of view for playing online games. You can move your camera independently of your character and swivel around and look at him, and zoom in and see him up close. There’s Cherryble (I’ll remove the interface here) a rather elderly looking hobbit. Hobbits as you know are a little bit plump, and Chernobyl looks a bit melancholy right now, a little bit concerned, I think he may be worried about this sinister keg over here. You can even, in LOTRO as in many online games, zoom all the way in and operate your character in first person mode, which is something that one rarely does in online games, unless you’re a really experienced first- person shooter because it can be disorienting. There are times, perhaps when you’re in combat and you have to be certain that you’re positioned exactly right, or you’re against a wall, and so you can’t have the camera behind your behind you. There are certain times when you want to play in first person inside a game like Lord of the Rings. The last point of view is a panorama point of view, which is again somewhat harder to play, because it’s harder to control your character in a nuanced way while being very far away from them. But it’s very good for looking at scenery and admiring the landscape and zooming out and, and looking at all your friends gathered together in Bree. Don: It strikes me that there’s more than one kind of third person point of view. There’s a static kind of third person point of view like the classic side scroller Super Mario Brothers where the camera (we don’t even think of it as a camera but really there is) focuses on the action and you don’t have control over that particular lens. This is not something that went away with the side scroller. In fact more complex games like God of War insist that the camera has its own fixed point of view and you manipulate the character only. That’s somewhat different from these games where you have control over the camera. Jay : It’s really distinctive. Chelsea: It’s interesting talking about cameras as being the narrator. You get situations, like you say in side scrollers, where there is a change in what the camera does. For example it lets you know what you need to do in a given area. It may suddenly stop tracking the character, but begin to move and you realize that if you don’t keep moving it’s going to leave you behind and you’ll die. Don: To add to that, moreover, it actually allows for certain challenges to arise in the game. For example, you might not know about a treasure chest, because it’s hidden behind a column. If you had panoramic control of the camera you would be able to find the treasure chest. It actually adds an element of difficulty in some of the more complex games. Deanne: I find that when I play LOTRO what I’m seeing is obviously creating my point of view and that is very malleable. One of the sources of narration is the other characters. When you interact with a character and they tell you here is the quest that I need you to go on. They are giving us sort of more traditional, novel like form of narration. Jay: Yes. Would you call that a narration or would you call that just interaction with a character in a narrative? Deanne: Well, in the sense that they’re setting up the story that you are going to be experiencing, at least the skeleton of that, because of course, you can operate within that as much as you want. Jay: Yes, I like that thought. It’s a kind of micro-narration, a micro-narration that sends you off on a quest. Often, unfortunately, those little dialogues are pretty lame. Deane: I like them. I enjoy it. Jay: I’m glad you said it first. Well I’m glad for both reactions. “Story is the term for events in their chronological order “regardless of how they are or we encounter them in any particular narrative. “Discourse” is the term that we now use to refer to the order of the events as they’re presented in a novel or a movie. This distinction is really crucial to thinking about time that has all kinds of implications for how time is organized in a narrative. One way that you think about time is to measure the logical chronological order of events in story against how they’re actually depicted in the narrative, in the discourse. So that then you’re able to talk about how they, those have been altered. The truth is events can be rearranged in any way an author or filmmaker wants to. The story remains strictly chronological. So this distinction of story and discourse is really only a methodological one, it’s important for today’s lesson. 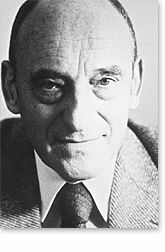 Gerard Genette, a renowned French theorist of narrative, said that there were three alterations in temporal sequence that you needed to account for in order to think through, carefully, the relationship of time to story. The first was order, the next is duration, the third is frequency. I’ll just say that we’re worried about duration and frequency, because today we’re going to focus on order. Duration is just how long it takes to read or view the narrative, as opposed to how long the events take in the story. Frequency is how often an event occurs in the discourse. Order refers to the way in which the discourse has rearranged the events in the story. These are three chief ways that novelists, poets, and anyone that tells a story, in whatever medium, have used to change the order. Can you think of one of them? Jay: Yes, flashbacks, for sure. Jay : Flash forwards, too. The third might be called ellipses. That’s what Gerard Genette says, ellipses, by which he means leaving out part of the story. Sometimes an ellipsis can be quite long. You could leave out hundreds of years with a phrase like ‘time passes’. Written works can avail themselves of the really subtle way to rearrange time and that’s by using the power of tense. Tense is so adroit at registering time shifts that often the reader doesn’t even notice it. It flies beneath the radar. They are sometimes very aware of how tense is signalling time changes. Film has developed its own vocabulary for handling this this. Film can handle flashbacks. What’s the common way to create a flashback in a movie? Deanne: First you zoom in on the character’s face so you have some indication of whose flashback it is. Don: And then the colour sometimes changes to a sepia tone. Chelsea : Sometimes there’s actually a flash. Jay: All of these are little devices that narrative cinema developed over years to substitute for tense in the grammar of cinema. We are pretty instinctive and just say yes, right, we’re fading, dissolving somewhere, some ‘when’, but until you get in to the, the scene, you don’t know where or when you’ve gone. You don’t know that you’re dissolving into a flashback until the end of the scene. One of the ways that fiction handles flashbacks is just to have a chapter set in a different time period. Then you have to figure it out for yourself or tease it out as you read it. Sometimes fiction that has a narrator will indicate a move back into the past by the narrator saying,’ I remember when’, to take you back into the past. Film does that too. What’s the most common way to have a narrator take you back into a past moment in film? These are just a few of the, the really common ways to handle flashbacks or flash forwards, for that matter, in movies. But there are lots of more subtle ways. I’ve by no means catalogued every possible way to capture a time change in a movie. I think that, as viewers, we’ve had to be educated to this grammar of cinema, because we didn’t have verbal linguistic methods of capturing time changes. Jay : In narrative cinema, the disconnection between the time of the discourse of the action in the movie, and the time of the viewer is immense, because you’ve got approximately an hour and a half to two and a half hours, but that’s it. You have to tell the whole story in just two hours. Filmmakers have always been restive beneath those burdens. They’ve done incredible experiments to try and play around with those limitations of their medium. Do any come to your mind? Have any of you seen the American television show, 24? There they experimented with having an hour of discourse time roughly correspond to an hour of story time. They spread it out over a number of weeks, not quite 24 because they usually began with two hours and ended with two hours. That was again an experiment playing with this problem of the radical nature of the dis-junction between discourse time and story time in cinema. The television show 24 was not the first to think of this ‘High Noon’ is probably the most canonical example. It’s a western that had roughly the same amount of discourse time and story time. Can you think of others? Jay: Speed? The movie about the terrorist on the bus? Deanne: Yes. 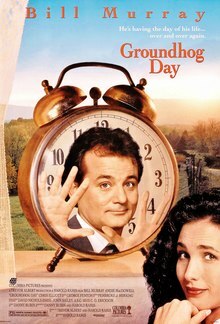 Groundhog day. Not incredibly profound, but it does do this interesting play with storytelling. It’s sort of allowing you to tell the same story over and over again until you get it right. Jay: Yes. That’s really a great example and it also touches on something we will discuss shortly when we turn to frequency, because it’s not only a change in the order of story time. Deanne: The alarm clock that starts every new day. Jay: That’s right. So it’s not only that play with order, but it is very unusual experiment with frequency of the same event occurring. I bet you can think of a thousand. Chelsea has thought of one. Chelsea: Yes. I was thinking about Forrest Gump. Where the whole story is him sitting on a bench telling a story to a woman who is sitting next to him and it’s all flash backs. Jay: So you begin with a narrator and then his voice fades out and you understand, as a viewer, that you are seeing what he is telling the lady on the bench at the bus stop. Deane: I’ve been thinking about Pulp Fiction. Jay: Yes, that amazing work by Quentin Taratino, the American director. The shifts in time in Pulp Fiction were so artificial and so much attention was drawn to them, rather than trying to hide them and make them blend in, that it really made Pulp Fiction a contribution to post-modern cinema. Your attentiveness to those time switches was a way of creating a meta-cinematic overlay to the really compelling action that was being portrayed on the screen. Jay: We’ve talked about it in novels and film, but really, every artistic medium has struggled to deal with time in one way or another. Even media that are very recalcitrant in showing anything about time like painting. Chelsea: Some painters will use a series of paintings to show the passage of time. 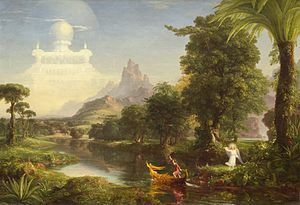 I’m thinking of Thomas Cole‘s The Voyage of Life, where he has four paintings showing a single person in different stages of their life. Jay: Right. Painting is a relatively static medium. That doesn’t mean that painters haven’t struggled against this limitation, just as filmmakers have. Don: What about time lapse photography? Jay: Exactly, that’s another attempt to stretch a boundary of a medium. Jay: Like in the decay of something in the landscape. 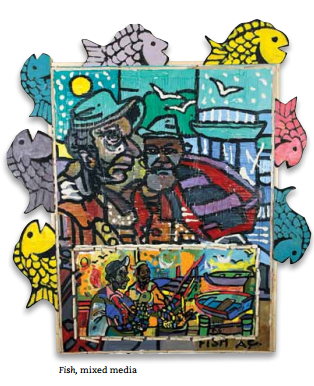 Deanne: Actually, the painting behind both of you indicates a previous time with the boats and referring that these fishermen were in the boats catching the fish before we see them holding their catches. Don: And the fish circling the frame form the frame they really indicate that. 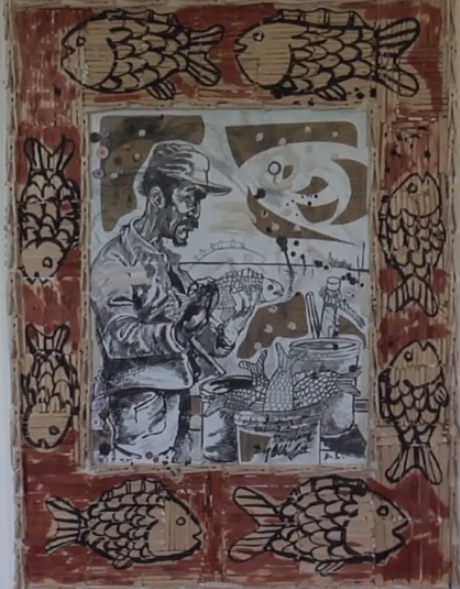 It suggests this continuous space of fishing, and the title is of the piece is “Fish”. Chelsea: Not to mention the position of the sun in the lower frame is a bit lower and closer to the side than it is there, and less hazy up here, which suggests that this maybe was early morning, and this is during the day. Don: And his use of colour too, there the colour seem brighter with more contrast and vibrancy than at the bottom. Don: Which indicated different time of day, I think. Jay: When we turn to games, we find that game designers are faced with an even larger technical and narrative challenge in trying to deal with time shifts. They do it. They’re continually stretching the boundaries, trying to find ways to deal with time. But one of the big challenges for games is that the player is actively engaged in the present, in an activity that he or she is pursuing. So you have a visceral, physical engagement with present action. If the narrative needs to take you into the past it becomes really tough. You can transport the character, the player’s character, back into the past, for example, but then you’re in a narrative past. But you have the same character you had a second before that was in a different time period. There’s a disconnection that is even more radical than the disconnection between discourse and story in film. The most common way of handling this difficulty is to have a cut scene that fills you in on important back story, or after you completed a level in the game, might talk about the worldwide or universe spanning implications of the actions your character has just completed. That is a common cut scene in games. It is so artificial that debate has raged in the gaming community over whether cut-scenes are just a complete violation of everything that should be in a game. Cut-scenes have their defenders and they have their severe critics. We don’t have any need to settle or even address the pros and cons of that because we’ve already been able to make the point that cut scenes are a pretty dramatic change, technical as well as meteorological change, in order to register time. How else do games change time? Instances for example, you go in to an instance, you can have an instance set in a really different time period. Same problem, you’re going in. Some instances are scalable so you go in with it scaled to match you or you can downscale it and go in at a lower set of ability levels. That’s a way to try and adjust your character to the time of the instance. Don: There’s also just the passing of time in the game as evidenced by the sun setting and then the night sky coming in and even weather. Like the idea that weather is coming, that it wasn’t there before, so there are these other indicators that. Jay: That’s a very important, that’s a very important baseline of time. 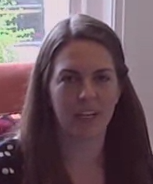 Chelsea: Relatedly, in game there are things that you do that take time. I’m thinking about growing crops, for example. I remember when the Pokemon franchise introduced this, you had to grow certain things and you would come back later. Jay: That’s right, that’s right. Then a number of games adopted that method. Sometimes there are certain quests that you can only do once a week as a way to make your player experience time passing. Don: I’m also thinking of really old school, like the Super Mario Brothers franchise, where you have a certain amount of time to complete an objective before the clock runs out and then it’s game over. So it’s a way that I think early game designers dealt with this problem, because they couldn’t do things like introduce weather or passing of the day so gracefully. Jay: Limits on playtime have been a feature of lots of games inside and outside of digital gaming. Just think about the clock in a football game; American football or the rest of the world’s football. There’s a time limit and you play against that. Having that kind of time limit is not very easily aligned with a narrative time, is it? unless, unless, …..I take that back – unless you have a quest to deliver something within a set amount of time. 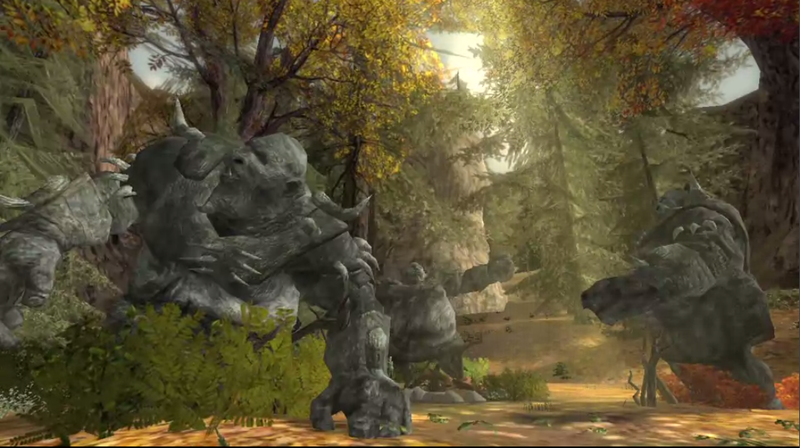 Deane: Yes, and the maze and the anniversary in LOTRO. In the anniversary challenge you have a time limit on a couple of different tasks in the maze. Jay: That’s right. And so that synchronizes narrative time with player time. Don: Yes. There’s this game, that’s not out yet. It’s coming out, it’s for the Playstation 3 and Xbox. It’s called Final Fantasy XIII-3: Lightning Returns (Lightning Returns: Final Fantasy XIII). As I understand it, it is designed to be synchronized with real time clocks that are outside the game. So you have to beat the game in, I think, 13 days or that’s it. The world will end in 13 days, and you’ve got 13 days to do it. Jay: So it’s like 24 or High Noon. Don: Exactly. And I think you can defeat monsters to gain some time back. There are ways that they play with them..
Jay: LOTRO created a special way of dealing with flashbacks. They created a module that they called a session play. What LOTRO designed for session play was to have you play a different character, a character from the past event. 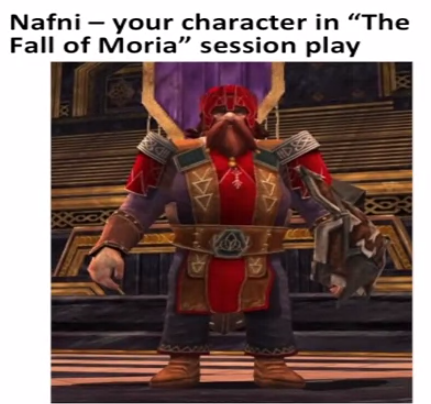 One of the first that I remember (it, may not actually be the very first one I encountered) was the fall of Moria where you played a Dwarf named Nafni. You go back in time and you play this dwarf. You may or may not be a dwarf in the actual game, but you have to play that dwarf. You watch them digging deep down into the earth in greedy search of Mithril, finally bursting through and discovering the Balrog, Durin’s Bane. That’s a clever, but again an intensely artificial way to go back in time. They had another method that they introduced with a lot of explanation actually outside of the game in their developer guides and developer chat sessions. When you reach Rivendell, and you’ve completed your epic quest, you got to see The Fellowship depart Rivendell. It was very hard for them to have the fellowship be in Rivendell and depart Rivendell when you’re going to come back to Rivendell again and again and again. They moved the various characters from the fellowship into special closed rooms that you could only access if you’d already done the epic quest that allowed you to see into the past the departure of the fellowship. You can see Turbine actively struggling and creatively overcoming some of the difficulties of making time past available to a player. By Louise Taylor in Digital culture, Online Games on August 18, 2014 . Thank you for transcribing the lectures and augmenting them with your video demonstrating how the camera controls allow the player to manipulate point of view, within limits, in a video game. missed your notes dearly!! How was your vacation?